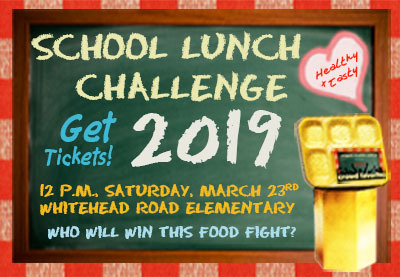 Join us for the 2019 School Lunch Challenge -- a fun, educational event engaging the Athens community with the past, present, and future of the National School Lunch Program! The centerpiece of this event is a cooking competition which invites participating teams, advised by members of the Clarke County School District (CCSD), to create dishes in accordance with USDA guidelines for the National School Lunch Program. Attendees will be invited to sample these dishes. A panel of student judges drawn from CCSD schools will vote to determine an overall winner. The winning team’s plate will be incorporated into the CCSD school lunch menu during the 2019-2020 school year. In addition to the cooking competition, the event will feature cooking demonstrations and information tables hosted by groups connected to sustainable agriculture, community gardens, and childhood nutrition in the Athens area. The event is free and open to the public but only 200 tickets will be made available. Tickets are available through the Eventbrite website at https://2019schoollunchchallenge.eventbrite.com. For more information, contact Kaylynn Washnock at washnock@uga.edu or (706) 542-5788.